A traditional Gin & Tonic is cool and crisp, brightly flavored, a splash of citrus and a little woodsy. 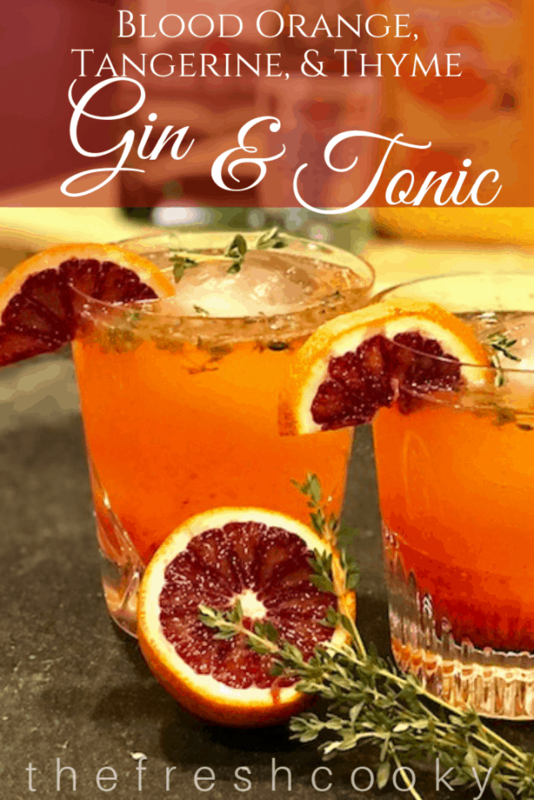 For the Blood Orange, Tangerine and Thyme version; you’ll add the perky sweetness of a blood oranges along with the mellow citrus tones of tangerines, the piney hint of thyme and you have the makings of a lovely winter cocktail. NOTE: 21+ This recipe contains alcohol, please be responsible. TIP: Easily convert this to a non-alcoholic drink. Increase the tangerine juice and tonic, omitting the gin! I have a thing for Gin & Tonics*; probably because it was my Dad’s favorite drink. I miss him! Tangerines and Blood Oranges are in season! 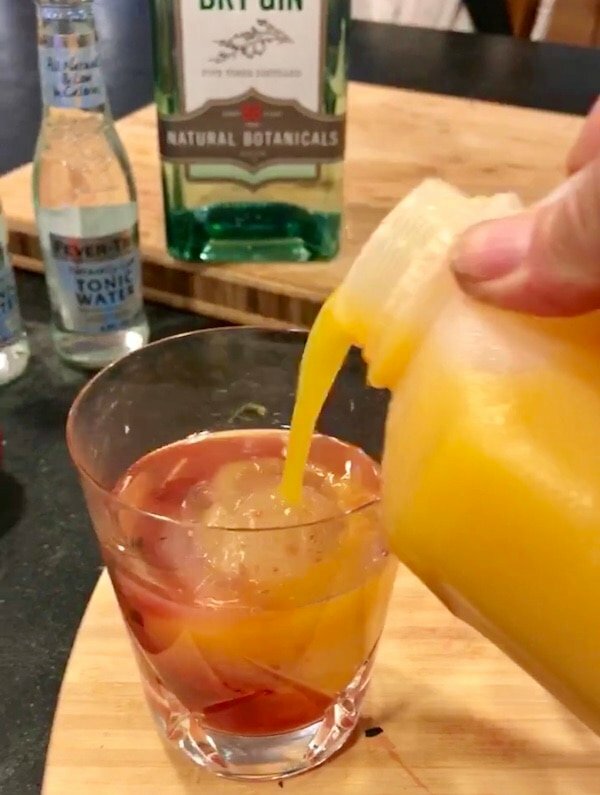 Last week I bought a bag of blood oranges and a bottle of tangerine juice from Trader Joes; I thought they would be so pretty made into a specialty gin and tonic. So I tinkered around last night and came up with these beauties! 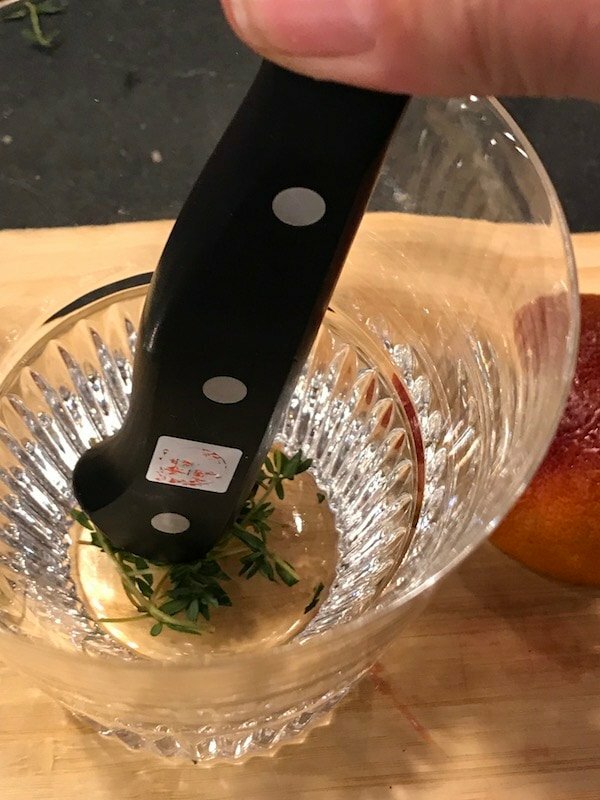 Start by placing a couple sprigs of thyme, then muddle (crushing) it, I was lazy and just used the end of my knife, if you have one, use a muddler. 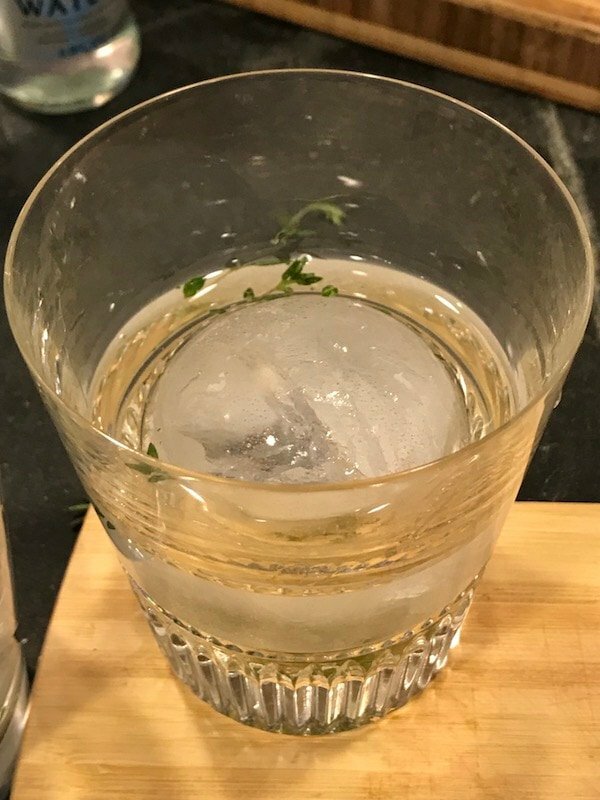 TIP: My husband didn’t like all the little bits of thyme in the drink, so once muddled, scoop the pieces out, if desired. The oils will cling to the glass. Pour in your gin. Psst, got one of these mini measuring cups? I have two and use them all-the-time! Squeeze 1/2 of a blood orange (you can substitute a naval orange or a ruby red grapefruit if you can’t find a blood oranges). Pour in a healthy splash of tangerine juice (found at Trader Joes & specialty stores), if you pour slowly you might get a pretty little separation of the colors. Substitute with orange juice if you cannot find, or squeeze 1-2 tangerines or clementines. Finish it off by filling up the rest of the glass with tonic water, I love FeverTree Naturally Light Tonic or QDrinks Tonic. Garnish with a twist of thyme…I like to tie a loose “knot” in the sprig. …add a slice of blood orange to the edge of the glass as a garnish, serve immediately. 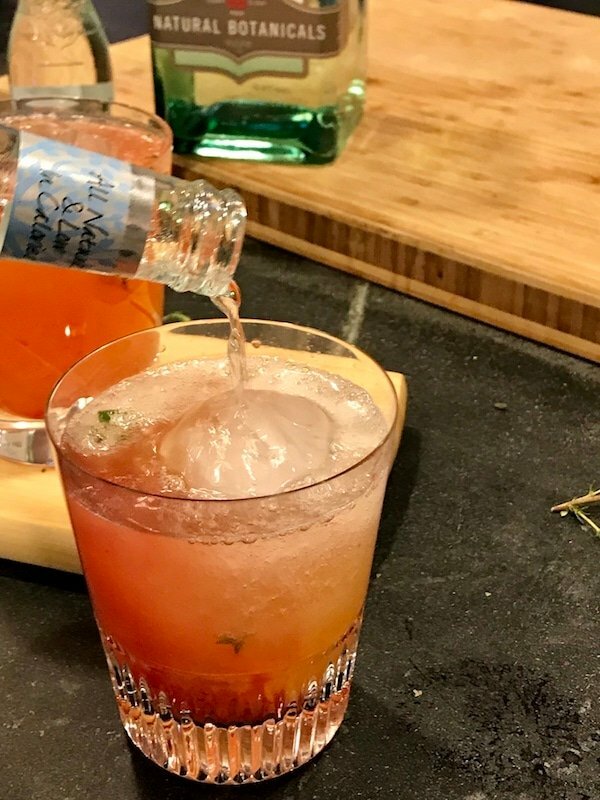 This recipe was inspired by A Farmgirls Dabbles Cranberry Thyme Gin & Tonics. The bright colors drew me in…give it a try as well! 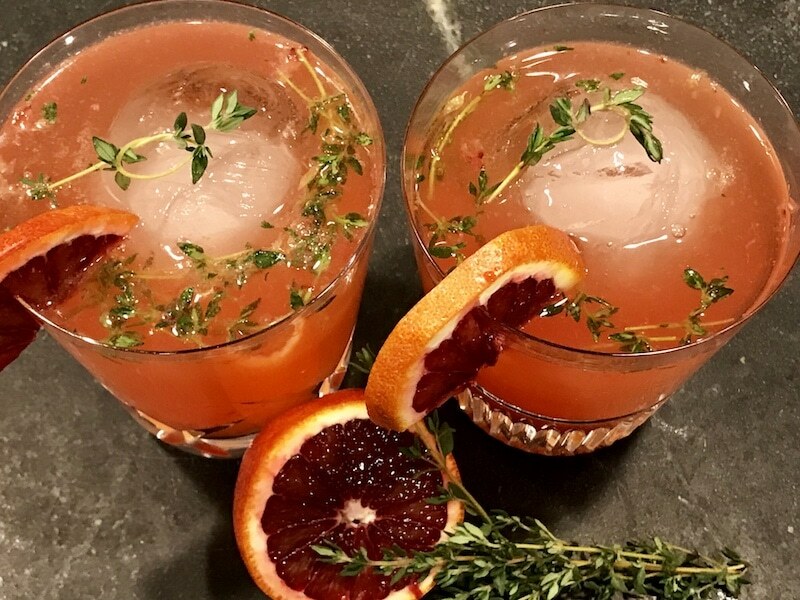 A twist on the typical Gin & Tonic, incorporating seasonal fruits and thyme. 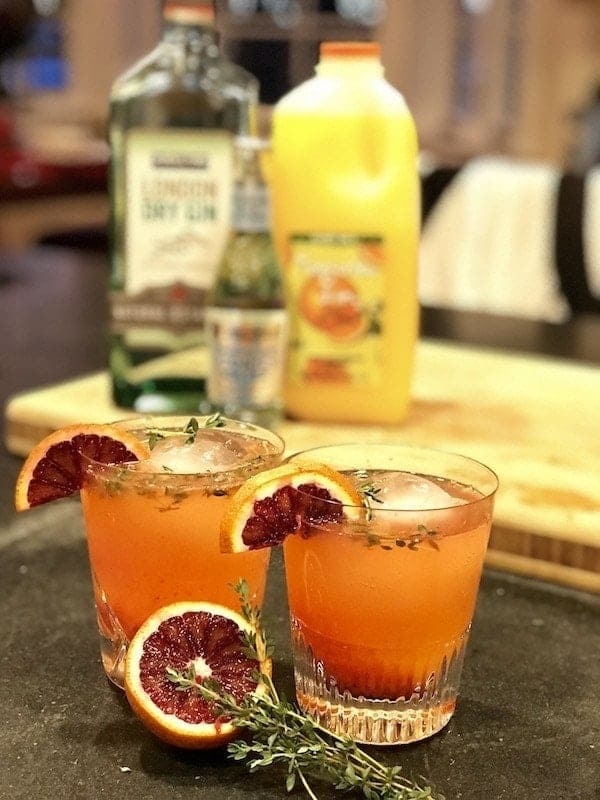 Blood orange and tangerine enhance this bright and lively cocktail, perfect for a dinner party or a romantic dinner. In a highball glass, place a couple of sprigs of thyme and muddle (crush) the thyme against the bottom of the glass. If desired, remove the thyme before proceeding. 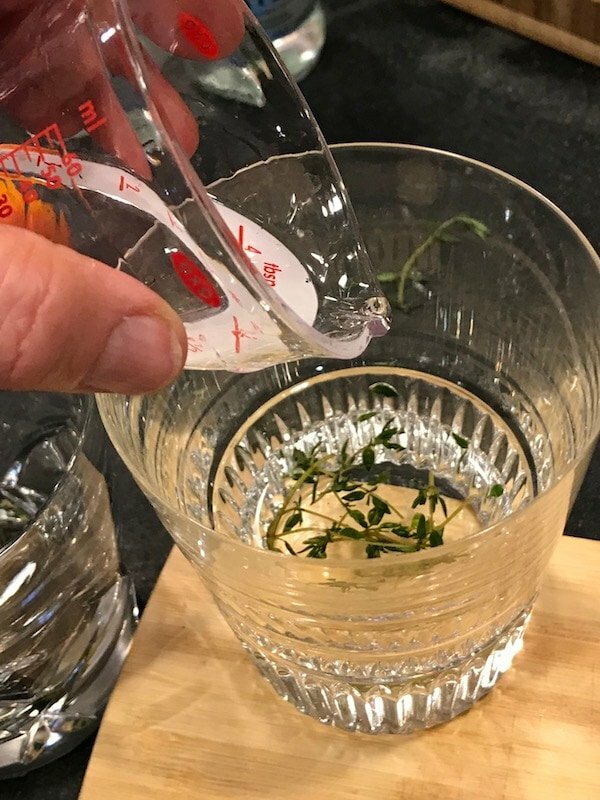 Measure and pour gin into glass. 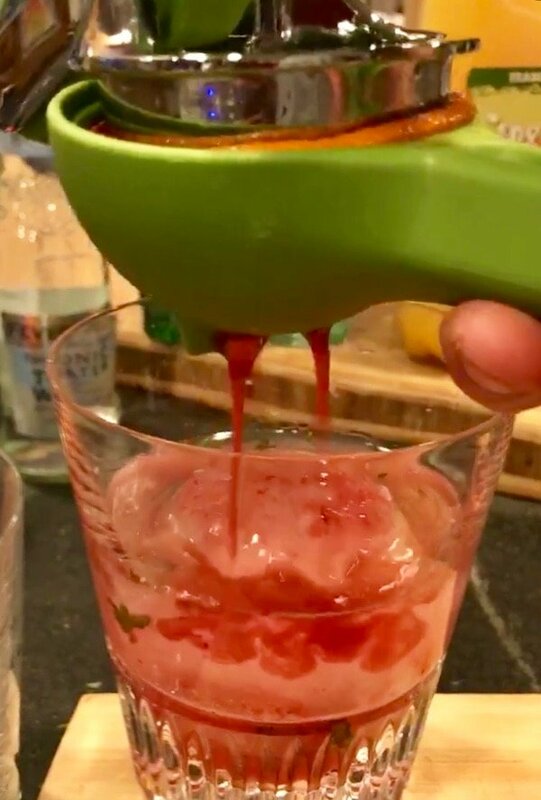 Squeeze 1/2 of blood orange over ice. Fill up glass with tonic water. Garnish with slice of blood orange and sprig of thyme. Note | Easily convert this into a “Mocktail” by omitting the gin, increasing the blood orange to a full orange and increasing the tangerine juice as desired and tonic water. 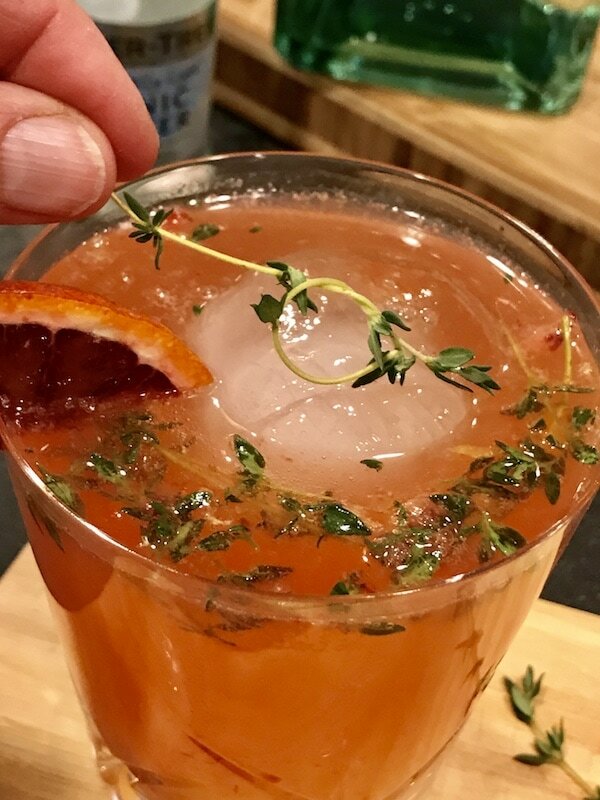 Copyright 2018 | This recipe for Blood Orange, Tangerine and Thyme Gin & Tonic was featured first on The Fresh Cooky.